In this article, we’re going to discussing what the best guitar audio interfaces are in 2019. We decided to write this article after realizing that there are no significant resources which are firstly up-to-date and secondly talk about the different options available for those ‘guitar techies’ and musicians who are looking to record guitar in their home-studio environment. Now, we’ve structured the article in a very logical format, so that it’s easy to follow, segmenting on the main criteria, which is the number of inputs available. This is because we’re certain to have a wide audience of musicians/engineers/guitarists looking at this article, each with different technical requirements from the audio interface… And inputs is probably one of the most important technical specifications. Additionally, the sub-criteria that we’ve used is, of course, price/cost… Since everyone will have a certain budget in mind. For those who are in a rush, we’ve condensed all of the products in a neat table directly below… However, if you can, we advise that you read the full product descriptions and look at the video demonstrations, as they will provide you with an accurate representation to how the audio interface performs when recording audio. So let’s get to it, what are the best 10 audio interfaces for guitar recording. The unit itself utilizes a 96Khz sample rate, meaning that all of your input signal frequency is accounted for, and the analog to digital conversion is done at 24 bits, so it’s fantastic for a little unit, which is fairly inexpensive. The audio interface also comes pre-loaded with Amplitube for your device and DAW, a guitar and bass tone studio which can be used to create an sculpt a virtual pedalboard and guitar rig, which then can be used with the iRig HD2 for live performance or recording. For the price, this unit really sounds great! There’s no wonder considering the 96Khz sample rate and A/D 24-bit conversion. However, it won’t make a bad instrument sound good, it merely provides a very accurate representation of your instrument’s natural amplified sound. According to one review, since this is bus-powered, it means that it relies on your device’s battery life… Which is potentially a limitation if your device’s battery life isn’t so good! This audio interface is perfect for the musician who ONLY wants to record guitar, and potentially use this as for virtual stompbox emulation for both studio/live performances. Additionally, the unit itself utilizes a 96Khz sample rate, meaning that all of your input signal frequency is accounted for, and the analog to digital conversion is done at 24 bits, so it’s fantastic for a little unit, which is fairly inexpensive. The main difference between the iRig HD2 & the Pro is an additional XLR/Midi functionality…. 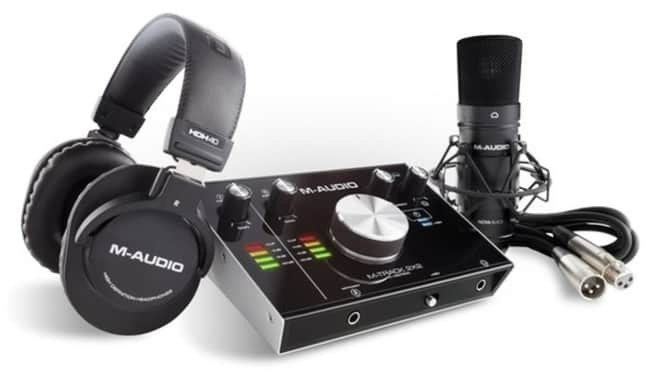 and due to this (XLR/Microphone) recording functionality, it also features an optional 48v phantom power, which can be used on condenser microphones. Not only this, but it also has a MIDI input port, so you can easily connect a MIDI keyboard for playing virtual instruments with SampleTank (included software). What we really like about the unit is the fact that it provides a highly visible audio level LED indication, with red signalling that the input gain is too high, and green suggesting that it’s too low. The audio interface also comes pre-loaded with Amplitube for your device and DAW, a guitar and bass tone studio which can be used to create an sculpt a virtual pedalboard and guitar rig, which then can be used with the iRig Pro for live performance or recording. At this price-point, there’s simply not much that we can suggest which should be improved. However, the owners manual says that you can get around 3.5 hours of recording time from NiMH rechargeable batteries, and 45 minutes from alkaline batteries, so be sure to use NiMH batteries. The audio interface is ideal for the musician who requires ultra-high quality recording specs (96Khz sample rate and A/D 24-bit conversion), whilst also having the option to record Guitar, Bass, Keyword & Vocals. The Apogee Jam 96k is an audio interface targeted towards musicians who are looking for an interface supplying high-quality circuitry, reliability and manufactured by an authority brand within the industry! 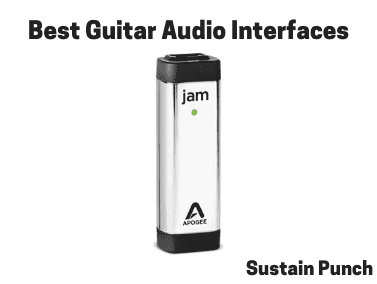 The Jam is very small in size, and particularly easy to use, with just a TRS input, USB output and a gain control knob on the side, making the entire recording experience particularly simple and streamlined. However, typical of Apogee, they’ve used their PureDigital Technology within the unit’s preamp, to really give it that oozing quality, that we all know the brand is capable of providing in near to all of their products. As you may have already gathered, the 96k refers to the sample rate, offering 24 Bit Analog/Digital Conversion. The interface is MFI certified, which means that it provides 100% compatibility with Apple products (iPod, iPad and iPhone), with Apple verifying this. Additionally, it can be used with some of your favourite DAWs including Garageband, Logic and MainStage. As you can hear from the video demonstration below, it provides a really impressive, professional sound quality! We’re extremely impressed, but this shouldn’t be a surprise, as Apogee are renowned for their equipment’s incredible sound quality. However, as we’ve previously mentioned, this won’t make a bad instrument sound good, it will merely provide a very accurate representation of your instrument’s natural amplified sound. Considering that the interface has some very positive reviews on Amazon, it’s hard for us to knock it! However, we like to be critical, especially for more expensive equipment, as we believe this really should provide high sound quality. Since this audio interface is specifically designed for electric guitar and bass guitar, it’s very easy to see who this unit isn’t for (i.e vocalists looking to record). However, taking into account the very solid reviews on Amazon, it’s clear that it’s a great interface for those who are just looking for a guitar/bass recording interface. The Apogee One is the perfect combination of incredible engineering and sleek-looking aesthetic design. The unit has an aluminium housing, and is extremely compact in size, making it perfect for the musician who doesn’t want a large audio interface, whether or not that’s for the sake of portability or just personal preference. Even despite the One’s small size, since it’s created by Apogee, they’ve managed to pack some impressive circuitry into such a small space, with it boasting a 96kHz sample rate and 24-Bit A/D conversion, this has meant that this unit sounds AWESOME! We were so impressed by the sound quality that we could achieve with this unit! Not only this, but it also has an in-built microphone, which we quite frankly were absolutely blown away by! It sounds as good as most premium-priced condenser microphones that you can find on the market today. That means, not only are you getting a premium-sounding audio interface, but also a wonderful microphone too! That’s everything you need to create your next album! Take a listen to the video demonstration below to get an accurate indication of how this interface performs. This unit is ideal for the musician who’s looking for an incredibly compact, well-designed audio interface, which just so happens to also include a high-quality microphone! 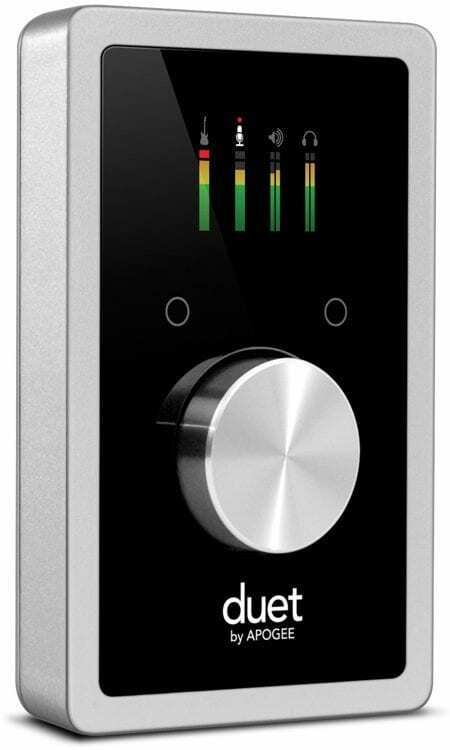 The Apogee Duet is the perfect combination of incredible engineering and sleek-looking aesthetic design. The unit is very similar to the Apogee One, having an aluminium housing, and is extremely compact in size, making it perfect for the musician who doesn’t want a large audio interface, whether or not that’s for the sake of portability or just personal preference. However, the unit differs from the Apogee one in a number of ways, having numerous additional features which may make it more attractive for the musician with an extra couple hundred dollars. It has in-build softlimit technology, which helps to prevent clipping before the A/D converter converts the signal… Although we like this feature, proper signal preparation would solve this issue. Additionally, the unit has 4 outputs instead of 2, meaning that you can route the signal to more destinations, which could be useful for additional processing. One of the key differences is that the Duet can process MIDI, which will be important for the producer, electronic music creators. Finally, one of the features that we wish the duet had, is the in-built microphone that the Apogee One has… Although I guess that you simply can’t get everything. None-the-less, the Duet is small in size, readily portable boasts Apogee’s impressive circuitry, utilizing a 96kHz sample rate and 24-Bit A/D conversion, this has meant that this unit sounds AWESOME! Similarly to the One, we were so impressed by the sound quality that we could achieve with this unit! Definitely a condenser for the Editor’s Recommendation, based from the sound-quality alone. It’s a little expensive for a 2-input audio interface, compatible for your iPad and iOS devices. Although it doesn’t come with the suitable cables for you to get started… What’s with that Apogee? Apogee is marketed as the ‘Apple’ of the audio interface industry, therefore it’s more than just an audio interface, it’s a statement of sorts! Equally, the Duet can walk circles around other interfaces when it comes to sound quality, so this interface is suited for someone who’s looking for sleek aesthetic looks, incredible sound, all for a premium price tag. The Presonus Audiobox USB 96 is a 2 x 2 audio interface, suitable for being your reliable studio solution for recording guitar, bass, midi or any other instrument which has either an XLR or TRS input. The unit itself is small enough to be portable but large enough that you’re not going to readily misplace the interface. Its made up from an all-metal casing, so you can rest assured that the internal circuitry will remain intact, even if you’re looking at carrying it around. However, we think this unit is more suited towards someone who’s looking for a more permanently located interface, for a home studio. Impressively, the unit boasts 96kHz A/D converters and a 24-bit resolution and 48V phantom power… Not bad for quite an inexpensive unit. Additionally, the unit comes with Studio One Artist DAW software and 6+ GB of third-party resources. Well, even despite us not being able to find a designated live demonstration of the unit, we have however found a video demonstration of a live comparison between this unit and the Scarlett 2i2 (which is also featured). The interface is not compatible with USB 3.0, so therefore if you only have a USB 3.0 port, then this unit will simply not work for you. Who is this interface for? The Presonus Audiobox 96K is ideally for a musician/guitarist who wants an audio interface for their home recording studio/setup, which is exceptionally affordable in price considering the technical specs. The Scarlett Solo (2nd Generation) is Focusrite’s most affordable audio interface, and before you think that affordability must mean low-quality, think again! The interface has some really impressive technical specs, with conversion rates of 192kHz and 24-bit sample rate. Not only this, one common issue with audio interfaces at this price-point is that they use cheaper internal circuitry, and this leads to latency issues… Well, the Scarlett Solo is the exception, an outlier to this assumption. 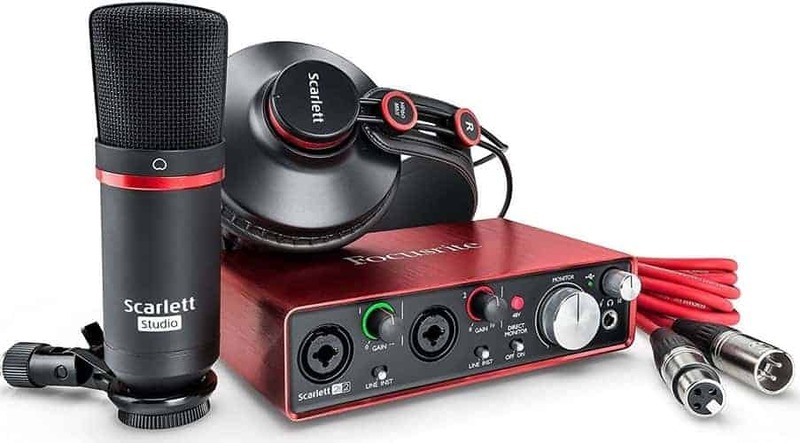 Focusrite state that the Scarlett series (2nd generation) interfaces have the lowest latency than any other audio interface… Which is a bold statement to make, and one in which I think that they prove, with the sheer amount of fantastic reviews that the unit gets on Amazon. The interface itself comes in a well-finished, high-quality metal casing, making it ideal to integrate within a home-studio setup. 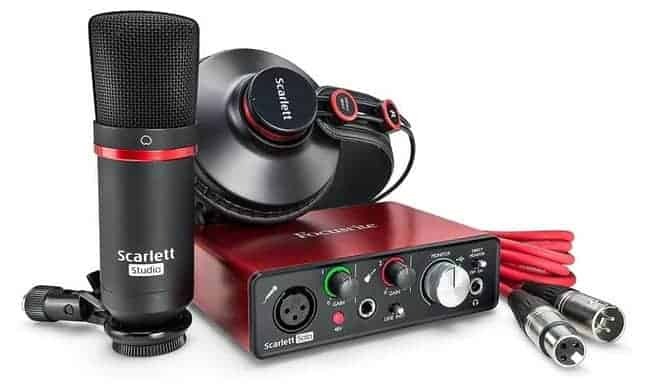 The Scarlett Solo is very simple to use, with having 2 inputs (XLR & TRS) it means that you can record 2 tracks simultaneously, i.e a guitar and vocals. Well, as you can hear from the demonstration video below, showing the audio interface recording a guitar take… This unit sounds phenomenal. We were seriously blown away with how professional it sounds. Some reviews have indicated that Focusrite’s customer service team are incredibly slow to respond… However, 99% of reviews say how great this unit is. This interface is ideal for a guitarist who wants a simple, affordable and reliable interface for tracking guitar and potentially vocals. High-quality recordings for an incredibly affordable price. Class-leading conversion & sample rates up to 192kHz/24 bit. 1 XLR (Microphone) Input, 1 Line (Guitar) Input for singular or simultaneous recording. Being an Amazon Best Seller, it’s clear that this audio interface is a fantastic prospect for beginners looking for their 1st audio interface. Looking into the specifications of this audio interface, it’s clear why it’s so popular, especially considering its inexpensive price. 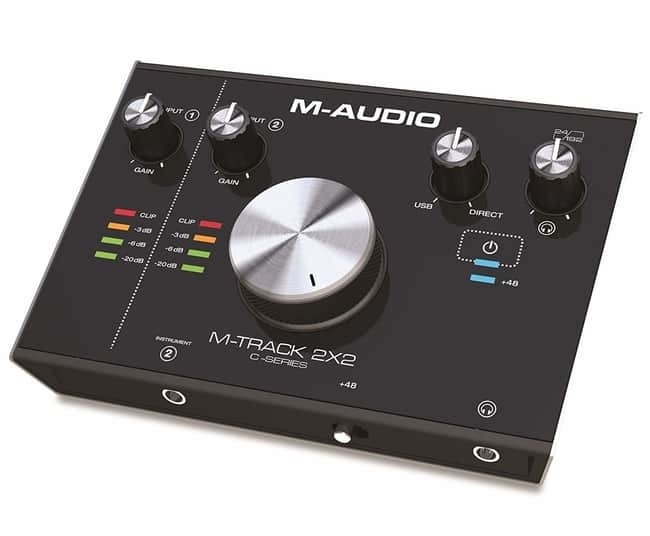 The M-Audio M-Track 2×2 unit is a sleek-looking, 24-bit/192kHz audio quality interface. As you can hear from the video demonstration, the sound quality that this unit provides is exceptional, and the demonstration gives a fantastic impression to the quality of recordings that you can expect. According to customer reviews, the USB connector is a little loose when plugged in, and this can lead to disconnectivity if the interface or lead is moved suddenly. All-in-all, it’s not the worst issue for those who are not moving the unit whilst it’s in use. This interface is ideal for the musician/guitarist who wants a sleek-looking interface for recording guitar, vocals and other instruments. However, if you’re looking for MIDI compatibility, be sure to purchase the MIDI integrated device. Class-leading conversion & sample rates up to a 192kHz/24 bit. 2 XLR (Microphone) Inputs, 2 Line (Guitar) Inputs for singular or simultaneous recording. Being an Amazon Best Seller, it’s clear that the Scarlett 2i2 audio interface is a fantastic prospect for guitarists who are looking for a reliable audio interface to record their guitar tracks, vocal tracks and other instrument tracks. Looking into the specifications of this audio interface, it’s clear why it’s so popular, providing super low-latency, 192kHz resolution, and 24-bit sample rate, especially considering its inexpensive price. Where this unit differs from its younger brother, the Scarlett Solo, is through providing two XLR/TRS combination inputs, as opposed to the Solo’s 1 XLR and 1 TRS input. Additionally, the Scarlett 2i2 also features two TRS L+R outputs, as opposed to the Solo’s two 1/8″ jack L+R outputs. Well, similarly to our reaction to the Scarlett Solo, we’ve been blown away with how For a 1st-hand view of the recording quality of the Focusrite Scarlett 2i2 (2nd Generation) take a look at the video demonstration below. Considering the technical specifications and price of the Scarlett 2i2, there’s simply not much that we can suggest should be improved. This interface is for the musician/guitarist who requires two XLR/TRS combination inputs, which in regards to recording guitar would be particularly handy for stereo microphone placement, double tracking and other creative techniques. 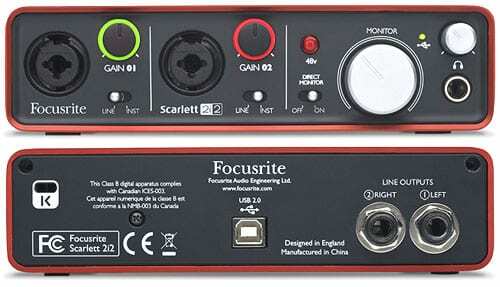 Before talking about the features or specifications, this Scarlett 2i4 is very similar to the Scarlett 212, except it has 2 additional line outputs, and 2 additional balanced outputs… Not only does this make it an ideal, high-quality device for recording guitar and other instruments, but also in a live performance environment. Being an Amazon Best Seller, it’s clear that this audio interface is a fantastic prospect for someone requiring minimal latency, high-quality recordings and several outputs. This interface is for the musician/guitarist who requires two XLR/TRS combination inputs and 4 outputs, as opposed to the Scarlett 2i2’s 2 outputs. These additional outputs would potentially be useful for someone looking to route the output signals to separate sources, i.e 2 sets of monitors, to get a more accurate representation to how the guitar mix sounds. If you’re looking for more inputs, let’s say 4, potentially to an instrument from multiple angles at one time, this interface is the perfect solution, offering high-quality hardware without breaking the bank. The Behringer UMC404HD is a 4-channel audio interface, although there is a 1-channel, 2-channel and 8-channel version available. The interface itself is more suited to being permanently positioned, as it’s quite bulky and would not be ideal to transport… With that being said, it’s made from a metal alloy and therefore if you needed to transport it, you can be sure that it won’t get damaged easily. The unit provides high-quality audio resolution, recording at 24-bit/192kHz, so you can be confident that you’ll get a good quality recording. One aspect that we were particularly impressed with, is the MIDAS designed microphone preamps that are used in this interface, helping ensure great audio quality. In the video demonstration below, they are reviewing the 4 input version. The hardware is still the same, and therefore the sound quality will be just as good! For the price-point, the Behringer UMC series provide great value for money, and alongside the unit’s technical specs, there’s not much that we can suggest that needs improvement. This interface is for a musician/guitarist who’s looking for an audio interface which can provide more inputs, with the UMC series providing 4-channel and 8-channel interfaces. Both of which provide great value for money, and hence it would be perfect for the guitarist who’s not looking to spend a large amount, whilst getting high-quality audio hardware.